The River Thames has been integral to the prosperity of London since Roman times. Explorers sailed away on voyages of discovery to distant lands. Colonies were established and a great empire grew. Funding their ships and cargoes helped make the City of London into the world’s leading financial centre. In the 19th century a vast network of docks was created for ever-larger ships, behind high, prison-like walls that kept them secret from all those who did not toil within. Sail made way for steam as goods were dispatched to every corner of the world. In the 19th century London was the world’s greatest port city. In the Second World War the Port of London became Hitler’s prime target. It paid a heavy price but soon recovered. Yet by the end of the 20th century the docks had been transformed into Docklands, a new financial centre. THE HISTORY OF THE PORT OF LONDON – A VAST EMPORIUM OF ALL NATIONS is the fascinating story of the rise and fall and revival of the commercial river. 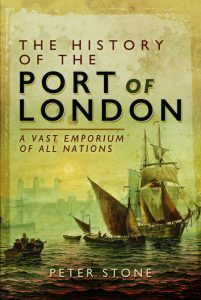 The only book to tell the whole story and bring it right up to date, it charts the foundation, growth and evolution of the port and explains why for centuries it has been so important to Britain’s prosperity. This book will appeal to those interested in London’s history, maritime and industrial heritage, the Docklands and East End of London, and the River Thames. A native of the city in which he lives, PETER STONE has for well over a decade studied London’s history and during that time written numerous articles for magazines and websites. His family has a long association with the East End of London and his ancestors worked as watermen on the Thames in the 18th century. Peter is a regular commentator about London on social media and is the creator of the popular website www.thehistoryoflondon.co.uk.